This rule helps us calculating the ATP details for an Order. Each rule is a combination of ATP computation options, time fence options, and supply and demand sources to use during an ATP inquiry. An ATP rule canot be deleted, but it can be renamed or redefined by updating the fields in an existing rule. 2. Navigate to the ATP Rules window. 3. Enter a unique name for the rule. 4. Optionally, select a type of consumption. You can choose both. 1. Forward: Uses the available quantity from future periods to cover a period shortage. 2. Backward: Uses the available quantity from prior periods to cover a period shortage. 3. If you selected Backward consumption, indicate whether ATP information should be calculated by carrying available quantity from one period over to the next (Accumulation). 4. If you choose to accumulate available quantity, enter the number of days to define this window of time in the Accumulation Window field. 5. 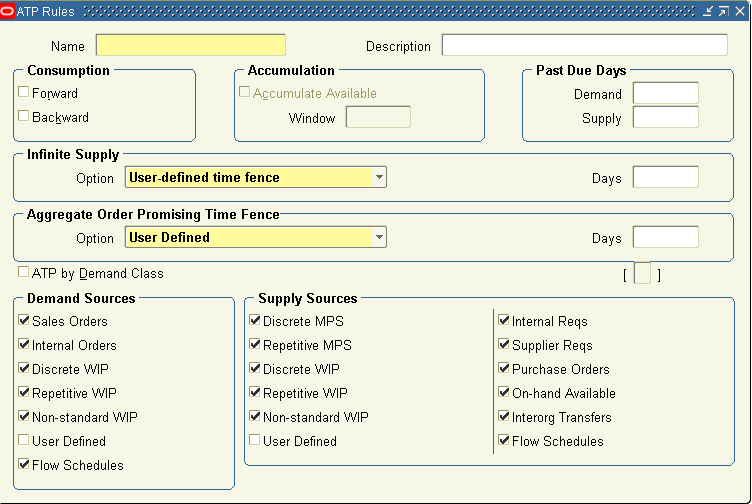 Enter the number of days to determine the past due demand and supply time fence dates. When calculating the ATP quantity of an item, Oracle Inventory does not consider any demand or supply source scheduled before these dates. 6. 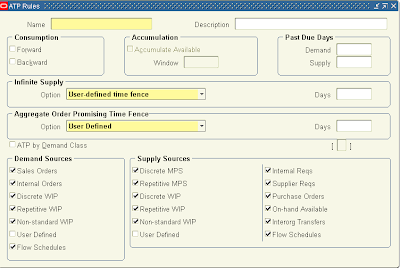 Select an Infinite Supply Option to determine the infinite supply time fence date. 7. When calculating the ATP quantity of an item, Oracle Inventory does not consider any supply source scheduled on or after this date. The infinite supply time fence date marks the end of the ATP horizon, after which Inventory assumes infinite supply is available to cover any scheduled demand. Cumulative total lead time: Use the cumulative total lead time of the item. Cumulative mfg lead time: Use the cumulative manufacturing lead time of the item. Total lead time: Use the preprocessing, manufacturing, and postprocessing lead times of the item. 8. If you choose the User-defined time fence option, enter the number of lead time days in the Days field. This field is not available with other Infinite Supply options. 9. Indicate whether to calculate ATP based on defined demand classes. Demand classes allow you to segregate scheduled demand into user-defined groups. 10. If you choose to calculate ATP based on defined demand classes the following Supply Source options are not available: on-hand available, interorg transfers, purchase orders, internal and supplier requisitions. 11. Select Demand and Supply Sources to use in ATP calculations. You can define multiple ATP rules to reflect the specific needs of your organization, and then use different rules to calculate availability for different items or groups of items. Each time you run an ATP check, the rule determines how existing supply and demand are matched. You can choose one of the ATP rules you define as the default ATP rule for your organization. You can update the item attribute ATP Rule to specify a default ATP rule for each item. 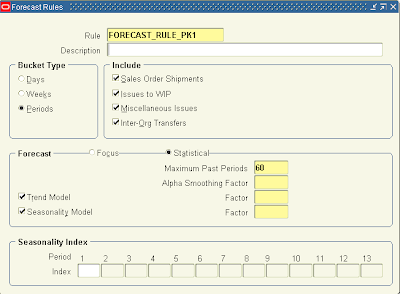 You can define forecast rules to use when loading forecasts. 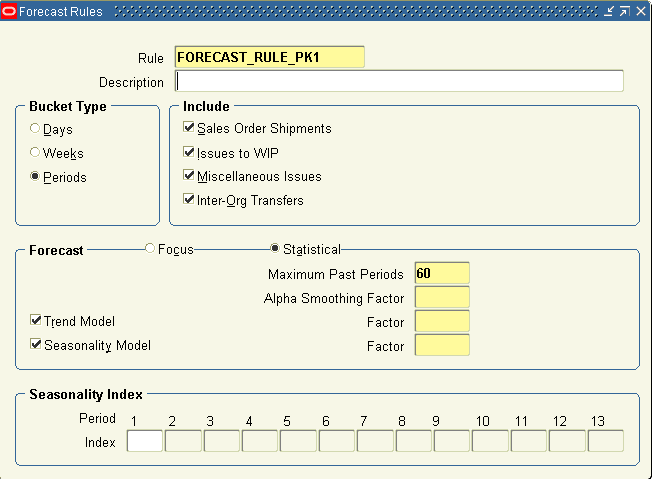 Defining forecast rules includes choosing forecast source options, entering statistical forecast parameters, and entering and adjusting initial seasonality indices. 1. Navigate to the Forecast Rules window. 2. Enter a unique name for the rule. 3. Indicate whether the bucket type is days, weeks, or periods. Sales Order Shipments: Includes sales order issue quantities. Issues to WIP: Includes WIP issue quantities. Miscellaneous Issues: Includes quantities issued with user-defined transaction sources, account numbers, and account aliases. Inter-Org Transfers: Includes quantities issued to other organizations. Focus: Uses focus forecasting algorithms to forecast demand for the item. This procedure tests the selected items against a number of forecasting techniques and chooses the best one, based on history, as the technique to forecast future demand. Statistical: Uses exponential smoothing, trend, and seasonality algorithms to forecast demand for the item. 7. Enter the factor by which to smooth demand for each successive period in the forecast. This levels demand throughout the forecast, reducing dramatic upward or downward fluctuations. You can enter values from 0 to 1. Values closer to 0 give more weight to past demand; values closer to 1 give more weight to current demand. 8. Indicate whether to base the forecast on a trend model. Turning this option on performs smoothing on the upward or downward trend in demand. 9. Enter the factor by which to smooth the trend change in demand from period to period. This produces a more linear rise or fall in demand from period to period over the course of the forecast. You can enter values from 0 to 1. Values closer to 1 give more weight to recent changes and trends. Values closer to 0 give more weight to historical trend. 10. Indicate whether to base the forecast on a seasonality model. Turning this option on bases the forecast on a seasonal adjustment you define for the forecast rule. 11. Enter the factor by which to smooth the seasonality indices you define by period for this forecast rule. This produces a more even pattern of seasonal demand from period to period over the course of the forecast. You can enter values from 0 to 1. Values closer to 0 give more weight to past seasonal indices; values closer to 1 give more weight to current seasonal indices. 12. Enter an index that describes the seasonal influence on the period. For example, 2 indicates that you expect the forecast to double in that period because of seasonal factors. You can delete a forecast rule if there are no references to it. When you define an item you choose a picking rule to determine the order in which revisions, lots, subinventories, and locators are picked for sales orders. Oracle Order Entry / Shipping submit requests to Oracle Inventory, which uses the information you enter in the Picking Rules window to generate pick lists for sales orders. If you choose None for any of the criteria fields, Inventory ignores that criterion. For example, if you choose None for Revision, Inventory picks units of an item without regard to revision levels. Oracle Inventory looks at the picking criteria in the order in which they appear in the Picking Rules window. Then, Inventory looks at the options (except for None options) for each criterion in the order in which they appear beneath each criterion. 1. Navigate to the Picking Rules window. Revision: Pick most recent revision. Effective Date: Pick earliest revision effective date. None: Do not consider revision levels in the picking process. Expiration Date: Pick earliest lot expiration date. Receipt Date: Pick earliest lot receipt date, the date you received items into their current location. Lot Number: Pick lowest lot number. None: Do not consider lot numbers in the picking process. Subinventory: Pick by order defined for each subinventory. Receipt Date: Pick earliest subinventory receipt date. None: Do not consider subinventories in the picking process. Locator: Pick items according to the picking order defined for each locator. Receipt Date: Pick items according to the earliest locator receipt date. None: Do not consider locators in the picking process. You can delete a picking rule if there are no references to it.